Alongside Chinatown, the fascinating historic enclave of Gastown transports visitors back in time to envision the city in the days of old. 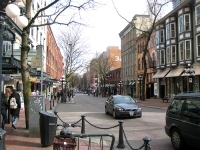 Set in the central core of Vancouver, it has cobbled streets, antique gaslights, Victorian architecture, narrow alleys, courtyards, and hidden boutiques and restaurants. Gastown was named after Vancouver's first settler and saloon owner, Jack 'Gassy' Deighton, whose historic hotel was destroyed in the Great Fire of 1886 along with much of the city. The fire swept through the town in less than an hour, leaving only two of the 400 or so houses standing. Gassy has been immortalised with a statue in Maple Tree Square in Gastown. Another point of interest is the Lamplighter Pub in the Dominion Hotel, which was the first Vancouver inn to serve alcohol to women. The Europe Hotel was the first fireproof building in western Canada, having been built just after the fire in 1892. Gastown keeps time with the world's first steam clock, which plays the Westminster chimes every 15 minutes on five brass steam-whistles inside its cast bronze case.